Temporarily relieves cough due to minor throat and bronchial irritation. AllegroMedical.com presents The Sunmark Tussin DM Cough Syrup. 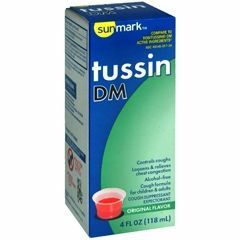 Sunmark Tussin DM4 fl. oz. Original FlavorTemporarily relieves cough due to minor throat and bronchial irritation. Helps loosen phlegm (mucus) and thin bronchial secretions to make coughs more productive. Alcohol-free. Cough formula for children and adults. Compares to Robitussin DM. Not made with natural rubber latex. Packaged: EachRobitussin is a registered trademark of Wyeth Consumer Healthcare.